We take pleasure to introduce ourselves as one of the renowned organizations, offering Hex Head Bolts. The offered hex head bolt is precisely manufactured using premium quality material and sophisticated technology in sync with the norms of industry. 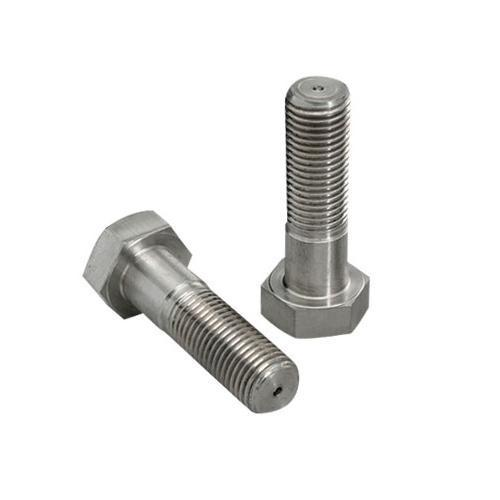 This hex head bolt is obtainable in various specifications as per the varied needs of customers. Moreover, our offered hex head bolt is checked on various parameters in order to deliver defect free range. 'WMI' Fittings and Flanges are manufactured with best available and carefully selected raw-materials such as Pipes, Billets & Rounds which are procured from reputed manufacturers viz. SAIL, VSP, JINDAL, MSL, Sumitomo, Dongshin, Sammi, REMI & RATNAMANI etc. of finest & latest metallurgical standards conforming A181, A182, A234, A350, A403, A420, BS, DIN, JIS & IS. "WMI" is presently equipped with modern manufacturing equipment's and inspection tools such as Milling Machine, Lathe Machines, forging and deep drawing presses, Heating & Annealing Furnaces, machining, finishing and testing facilities. In order to maintain quality and reliability of our products, our experienced and efficient technical personnel closely monitoring and maintaining the quality standards right from the raw-material stage to finished products. 'WMI' products are also manufactured and supplied under inspection by Third Party Consultants viz. BAXCOUNSEL, BVIS, CEIL, DNV, DALAL, H&G, IRS, IDEA, KPG, LINDE, MECON, PDIL, RITES, TCE, TICB, TOYO, UDHE. In addition to manufacturing of Pipe Fittings and Flanges, 'WMI' has diversified its business with growing vision towards dealing in all types and sizes of Industrial products viz. Pipes, Tubes, Plates, Sheets, Strips, Valves, Fastener Items, Packing material etc. 'WMI' is also Importer & Supplier of items made from Copper, Cupronickel, Brass, Admiralty Brass, Aluminum Brass, Bronze, Monel, Nickel, Inconel, Phosphorous, Titanium and Titanium Alloys, Brass & PVC coated. 'WMI' is also Stockists for Indigenous and Imported Pipes, Pipe Fittings, Flanges and Industrial Items. In order to meet off-hand requirement of our client, 'WMI', keeps a buffer stock of standard items of Pipes, Pipe Fittings & Flanges from sizes ½" to 24". Customers requirements of special items are manufactured with optimum standards in a limited time. Right product for the right requirement at the right price, i.e. rather than a mere supplier of the product. We take utmost efforts in understanding the client's requirement, identifying the right product at the right price. This has resulted in close ties with major customers within India & World-wide. We are committed to elevate the standards of our products and services to offer customer satisfaction through excellence in quality. Every employee is dedicated toward this aim and every measure and care is taken to ensure production of superior products, quality packaging, timely delivery, competent prices and excellent after sales service. We provide Manufacturer Test Certificates or Government approved Laboratory Certificates along with the supply of Materials. We also execute orders under Third party Inspections Being leading stockiest, we are in a position to cater all your requirements of the above mentioned items. We are well established. We are regularly supplying these items to many leading industrial Units consisting of CHEMICALS/FERTILISERS/ PETROCHEMICAL PLANTS, PAPER MILLS, CEMENT PLANTS/ SUGAR MILL/ FABRICATION UNITS etc. As we are regularly maintaining bulk stock in every item, we can arrange supplies in time and that too at the most competitive rates. We shall be thankful to you to kindly enlist our name with your approved Vendor list and favour us with your valuable enquires against your regular requirements. We would appreciate to get your esteemed enquires and look forward to the pleasure receiving your valuable response. Thanking you and assuring our best services at all times. In today's environment 'change' is a welcome phenomenon. Change brings with it a sense of challenge, a need to push ahead.WMI is geared to meet the challenging winds of change.